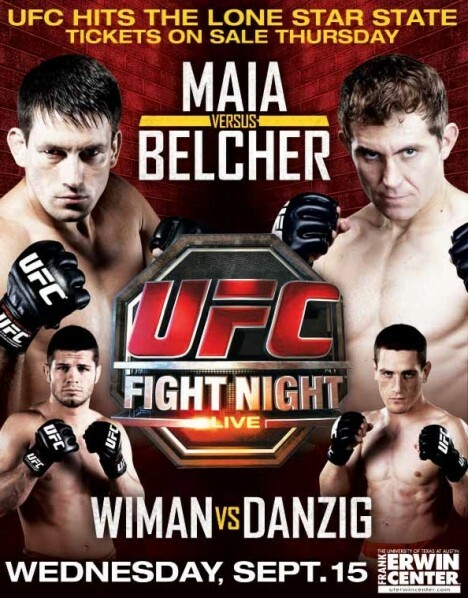 UFC Fight Night 22 is a must see fight with Maia and Belcher on the main card. Buy your tickets now or watch it on Spike TV. Another grand, must-see fight will take place on September as Allan “The Talent” Belcher will fight against Demian Maia on the UFC Fight Night 22 main event. The UFC Fight Night 22 is scheduled on Wednesday, September 15 at the Frank Erwin Special Events Center at the University of Texas in Austin, Texas. Ticket sales will be available on Saturday, July 17 at 10 a.m. CT. UFC Fight Night Club members and UFC Newsletter subscribers can get their tickets prior to the said schedule. Another match to watch on the event is the rematch between Matt Wiman and Mac Danzig from their controversial bout in UFC 115. The UFC Fight Night 22 tickets are available via StubHub.com and is also available for public viewing at Spike TV at 8 p.m. ET. UFC Fight Club Presale: Thursday, July 15, 10 a.m. CT.
UFC Newsletter Presale: friday, July 16, 10 a.m. CT.
General Tickets Sale: Saturday, July 17, 10 a.m. CT.